KEF USA Senior Program is located on a beautiful college campus in the heart of Orlando, Florida. We offer an intensive, total-immersion English program with 52 levels of proficiency and 30 hours of weekly instruction in state-of- the- art facilities. Modern classrooms, computer rooms with free internet access, bookstore, library, student lounges and cafeteria are available. The Intensive English Program accepts students ages 15 and older and runs year round, while the ESL for Teens program accepts students ages 10-11, 12-14, and 15 and older during the spring and summer. Our mission is to provide the highest quality English language programs to international students to meet their personal, academic, and professional goals while creating an environment that fosters cross-cultural understanding and appreciation. Our Approach: Learn real-world English. Using a "communicative approach" (CLT) to second-language instruction, classes are based on the theory that the primary function of language use is communication. Practicing the “80:20 Rule", the instructor’s goal is to create an environment where the students are communicating 80% of the time and the instructor is communicating 20% of the time. Students move at their own pace through our highly engaging curriculum. Practice in all four language skills: listening, speaking, reading, and writing. Improve your fluency, pronunciation, and grammatical accuracy. Instructors speak only English in the classroom at all levels of instruction. Gain a greater ability to understand native speakers by learning about American culture in America. Our city is known as the #1 tourist destination in the world with over 60 million visitors every year. Theme parks and first-rate tourist attractions along a wide array of cultural venues, promises something for everyone. An excellent location to practice English, meet Americans from every state and enjoy an action-packed vacation. 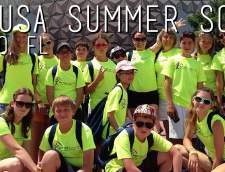 Based in Orlando, Florida, where culture and fun reign supreme, KEF USA provides world-class English language instruction to students of all ability levels. We are dedicated to helping students master the language through total immersion, small classes in state-of-the-art facilities, using college-educated instructors. Our programs are conducted in partnership with Valencia College, fully accredited by the prestigious Commission on English Language Program Accreditation (CEA) and chosen by Time Magazine in 2001 as one of the nation's best schools. KEF USA takes instruction out of the classroom and into theme parks, water parks, museums, and spectacular amusement facilities. Our students will use their English language skills during these excursions to engage park staff, and each other, and practice what they learn in the classroom in the context of a fun-filled experience. All entrance fees are included. The price of our program covers every aspect of our students' needs, eliminating any guesswork for the parents. The entire KEF USA staff is committed and carefully trained to ensure the highest level of safety, comfort, and convenience. The OHLA Orlando Campus, which was built in 2016 offers: •	Strategically centralized location •	Modern facilities •	Spacious classrooms •	Computer lab •	Student lounge and common areas •	FREE Wireless internet connection •	Open & friendly environment We are pleased to offer the following study options at this location: •	Semi-Intensive program – 20 lessons per week •	Intensive English Program – 24 lessons per week •	Super Intensive Program – 28 lessons per week •	Exam Preparation (TOEFL, CAMBRIDGE FCE OR CAE, IELTS) •	Semi-Intensive + Exam Preparation program – 35 lessons per week •	University Pathway Program •	Youth Camp Programs •	High School Program with the Orange County District (Grades 9th, 10th, 11th, and 12th) Additional on-site amenities: •	Restaurants such as Sports Grill, Marco’s Pizza, Habaneros Mexican Restaurant, Itar Bistro Market •	Fast Food Restaurants such as Subway and Taco Bell. •	Fitness Gym •	Grocery store •	Banks •	Easy access to public transportation •	Numerous shops Successful students at the OHLA-Orlando Campus can gain direct access to the University of Central Florida as well as to Full Sail University, both located in Orlando. Each institution recognizes the completion of OHLA English Program in lieu of TOEFL or IELTS. Bishops Gate English Experience is located just outside Orlando, Florida. Our program is a combination of English Language Development (3-4 hours daily), and athletic training and competition (3-4 hours daily). Our English program is staffed by certified teachers, all of whom are both native speakers and trained in the teaching of English at all levels. Coursework includes focus on reading, writing, speaking and listening. Our system utilizes a wide variety of activities and techniques in order to attain maximum English proficiency over a one-month period. In addition to English, our students enjoy the option to train in a variety of athletics at a high level. Golf, tennis, basketball and soccer are all available, played on top facilities and under the guidance of professional coaches. All of our facilities are A+ rated - luxury housing, superb dining hall, classrooms and study areas, and athletic venues. Finally, a piece of the program is social/cultural: our students enjoy trips to top Orlando amusement parks (such as Disney), waterparks, and other fun-based outings. As the English experience is coordinated with an existing sports camp, our English learners have the opportunity to engage and make friends with American students in housing, at meals, during sports, and on outings. 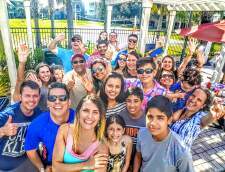 Learn English & live in your private teacher's home around Orlando with Home Language International! 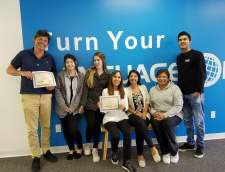 Home Language International (HLI) is a family-run business offering language courses in more than 20 languages in over 30 countries worldwide, including English lessons at an experienced private teacher's home in USA. More than 5,000 students take advantage of our services every year. Ian Josephs, Danielle Josephs, their 5 adult children and an expert team of dedicated staff all put in very long hours for HLI. You stay in an experienced teacher's family home, have one-to-one English lessons and then continue to use the language during the rest of your stay in Orlando. Because you are the only student, you are guaranteed individual attention. The lessons are completely designed for you, so the teacher will focus exactly on what you need. Mealtime conversation, television and social contacts are all in English. All of our teachers in USA have a university degree (or equivalent) and/or a recognised teaching certificate. All teachers have been visited by one of our local organisers. Their qualifications have been checked and their homes throughly inspected. During your stay in Orlando, a local organiser will monitor your progress and make sure your experience is both happy and successful. Home Language International (HLI) is accredited by the Accreditation Body for Language Services (ABLS), Association of Language Travel Organisations (ALTO), and UNOSEL. The Harvest English Institute is internationally recognized for teaching English as a second language at high-quality standards. Since 1999, the Institute has been using advanced methodologies that have allowed us to achieve the highest credential from the Department of Education of the United States. CEA accreditation MISSION “The Harvest Institute has as its main objective to integrate students with the English Language, American culture and way of life, providing them with the skills and knowledge to become linguistically proficient.” VISION To be a center that attracts and supports union through communication and culture. Fostering global citizenship and the understanding of people from different nations. VALUES Education – Respect – Ethics – Creativity – Constant Updating. *The Intensive English Program of all Harvest English Institute Campuses is accredited by CEA. Liberty Institute is an education institution which offers high quality courses, helping students conquer their objectives. We believe that it is through continuous education that the human being can be empowered to be free and best direct his/her life and career. Education frees, empowers and strengthens humans, transforming them from animals to intelligent beings. Managed by one of the partners, Bernard Vasconcelos, Master in Higher and Professional Education at the University of London, Liberty Institute offers English courses as well as other courses like Portuguese, exam preps, mentoring and much more. The methodology consists in focusing on developing fluency through practice, using the communicative approach. ELS / Orlando bevindt zich in het Stetson University Center in de stad Celebration, Florida, een buitenwijk van Orlando. Het centrum ligt op 97 kilometer afstand van de hoofdcampus van de universiteit van Stetson, in DeLand, Florida, en op slechts enkele minuten van de pretparken, waaronder Magic Kingdom®, EPCOT®, Disney's Animal Kingdom®, Universal Studios Florida® en Sea World®. The BRIDGE USA ORLANDO is an EDU-Vacation home school in beautiful Orlando offering classes and a calendar of exciting activities to continue language practice all day! Our teachers are native target-language speakers, have Bachelors Degrees or are currently enrolled in Professional Education Programs, and have completed The BRIDGE USA Language Leaders Professional Teacher Training and have received their TESOL Certification. We have a full daily curriculum for Speaking, Listening, Reading, Writing, and Conversation. We teach courses for conversation and academic university preparation or readiness examinations like TOEFL, IELTS, and more. We also offer Business English, and Technical English for specific topics as well. 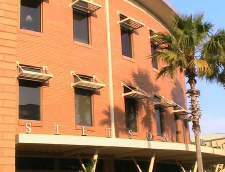 The BRIDGE USA uses award-winning textbooks and interactive online/downloadable programs in conjunction with an Online Student Library and nearby Orange County Public Libraries, and personalized online resources. 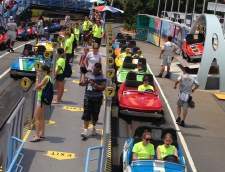 Since we are in Orlando Florida, we have daily, weekly, or monthly fun and educational student activities to places like Walt Disney World, Universal Studios Orlando, or lower cost activities like Daytona, or Clearwater Beaches, Gatorland, or International Drive area attractions like the Orlando Eye giant ferris wheel. Of u nu een student, zakenman of reiziger bent, er is een taalcursus in Orlando wat bij u past. Er zijn talencursussen beschikbaar voor alle spreekvaardigheid niveaus, leeftijden en duur. Kies een cursustype uit onderstaande lijst om te beginnen. Algemene cursussen Engels zijn voor volwassenen die hun spreek-, luister-, lees- en schrijfvaardigheid in het Engels willen verbeteren. Meeste taalcursussen zijn voor volwassenen van 16 jaar en ouder. 2 - 48 week taalcursussen verkrijgbaar. Meeste intensieve cursussen in Orlando hebben gemiddeld 30 lessen per week.